Ushuaia is a Naval Base, tourist and industrial port, capital of Tierra del Fuego Province, Argentine Antarctic Territory and South Atlantic Islands. It is located on the southern shore of Tierra del Fuego Island, the Beagle Channel separates it from Navarino Island, Chile. According to the 2010 census its population was 56,593 people. 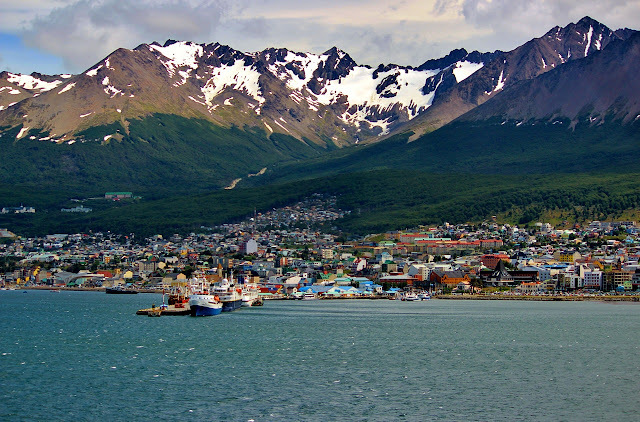 It has a very adequate tourist infrastructure as Ushuaia is considered the southernmost city in the World, although even further South, crossing the Beagle Channel is located the small town and Chilean Naval Base of Puerto Williams, of 2,500 inhabitants. It is surrounded by the Martial Mountains, home to the glacier of the same name, Olivia and Cinco Hermanos and which constitute, especially in Winter, the perfect setting according to its denomination of one of the southernmost inhabited places on the planet. The straight-line distance to Buenos Aires is 2377 km., and to Santiago de Chile is of 2382 km. By land, through National Route 3 from the neighboring town of Rio Grande. First you have to cross the border from Chile through San Sebastian pass, having entered the island by ferry crossing the Strait of Magellan, from Monte Aymond border pass or from the Chilean city of Punta Arenas. The passage through Chile should consider all the necesary documentation for a trip between neighboring countries, in the case of minors have authorization of both parents, and the prohibition to cross the border with perishable goods. By air, the Islas Malvinas International Airport is the operation center for all kinds of aircraft, the most used means of transportation to enter the island of Tierra del Fuego. Different airlines connect Ushuaia with the rest of the world. By sea, several shipping lines besides scientific vessels include Ushuaia as a stopover or starting point on their trips to Antarctica or the Fuegian channels. Created as such in 1994, today National Historic Monument, the Museum has readapted the building of the old prison of Ushuaia. It began as Maritime Museum, making known the regional history through its collection of scale models of ships that have sailed these frigid waters. A major attraction is the life-size replica of the Lighthouse of the End of the World, an icon of the Southern Seas indicating the entrance to the city's bay. The moving old prison Museum has a permanent exhibition of the former Jail, with research on the old establishment, pictures and details of the most famous prisoners. You can tour the pavilions that once worked as a Jail, some recreated, and a special relic: the Ala Historica, which is preserved in the state it was when the prison was closed in 1947. Another section is the Antarctic Museum Jose Maria Sobral, which was born from an Antarctic exhibition, with rich collections today covering a whole pavilion, classified by international guidebooks as "perhaps the best collection of Antarctic naval models in the World". There is also the Marine Art Museum of Ushuaia, MAMU opened in 2007, featuring a private collection of great masters of Argentine Art, focused precisely on marine themes. Visiting the Maritime- Jail Museum is a must, as knowing this place is the best way to learn the history of the region and realize that populate Southern Patagonia was a daring adventure. Opened in 1979 in the building where the Banco Nacion worked until 1976, museum charged with preserving the historical roots of Tierra del Fuego from pre-Columbian times to the twentieth century. Its collections are exhibited in five rooms, where are the showcases dedicated to the natives of Tierra del Fuego, explorers, personalities linked to local history, testimonies of ancient shipwrecks and natural history. For the cost of the ticket you can visit two museums: the End of the World and the Old Government House. A small museum located in 56 Rivadavia St., very interesting, tells the history of the Yamana or Yagan people, indigenous who inhabited the southern part of Tierra del Fuego, currently territory of Chile and Argentina, including the islands further south to Cape Horn, with original objects, scale models, explanatory texts and shocking photos. It gives us a clear vision of how the primitive inhabitants survived in harsh conditions for more than 10,000 years before the European colonization and their extinction when they came into contact with the new civilization. A recreation of the daily travel that the prison inmates performed to supply of timber the jail and town. As the forest decreased in size, the railroad expanded. The train operated since 1909, but the prison was closed in 1947 being replaced by a Naval Base, besides in 1949 a strong earthquake caused great damage to the railroad, so in 1952 the means of transportation ceased its operations. The current tour covers the last 8 km. of the original route that was 25 km. long, in a journey that combines history with landscape. The train departs from the "Estacion del Fin del Mundo", 8 km West of Ushuaia, picking up passengers along the Valle Pico in the Garganta Toro and Estacion Macarena where visitors inquire about the natives "Yamanas" or "Yaganes", who inhabited the region and stops at a point with panoramic view for 15 min. 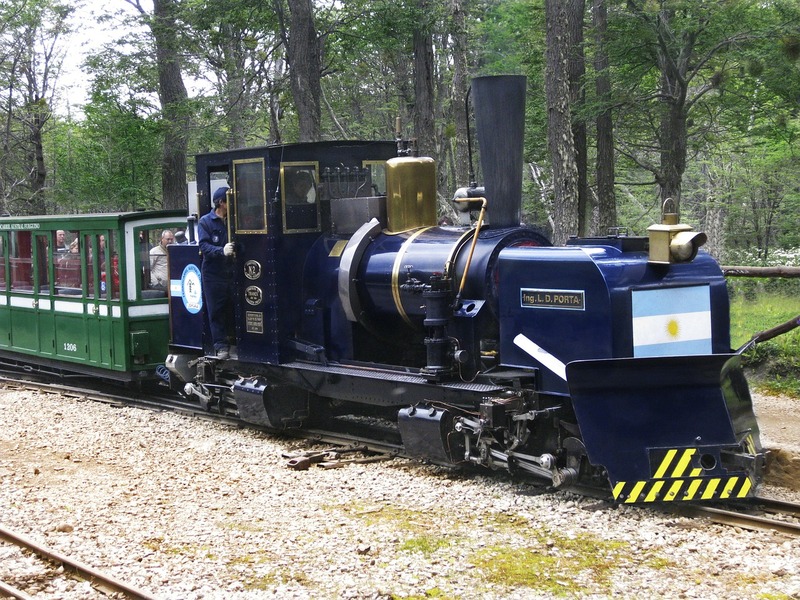 The train then enters the Parque Nacional Tierra del Fuego, where passengers board a transport vehicle that lead them into the park through the valley, returning to the Estacion Parque Nacional to start the return trip. Located in the southwestern tip of the Argentine side of Tierra del Fuego Island, 11 km West of the city of Ushuaia, covering an area of 68,909 hectares. It stretches from the Injoo Goiyin Sierra belonging to the Fuegian Andes, North of Lake Fagnano, to the coast of the Beagle Channel in the South. It can be accessed by car from Ushuaia, through National Route 3. In winter the use of snow tires or chains is obligatory. You can also reach Tierra del Fuego National Park by train, known as Ferrocarril Austral Fueguino or by catamaran to Lapataia Bay Pier. It is divided into three areas: Reserva Natural Estricta, whose access is forbidden; Reserva Natural Silvestre, with restricted access; and Area Recreativa, which is available to visitors. In the central part is located the Fagnano or Kami Lake, which empties its waters into the Pacific Ocean. Further South, facing the Condor and Guanaco hills, Lake Roca empties into the choppy waters of Lapataia river, which in turn, flows into the bay of the same name. Due to the harsh climate, the variety of animal life here is not as wide as in other latitudes, however can be found about twenty species of mammals and approximately ninety species of birds. In this regard, a species artificially introduced in 1946 to develop the fur industry was the Canadian Beaver. The animals adapted very well to their new ecosystem but the industry did not prosper and today these rodents are considered a plague threatening the ecosystem, the population of beavers in Tierra del Fuego exceeds that of its inhabitants. Within the Area Recreativa of Tierra del Fuego National Park are varied paths and places for trekking, also camping, boating, mountain biking, cycling, recreational fishing, bird watching and water sports in non-motorized boats, while during the winter the park is ideal for cross-country skiing. Located 26 km. from downtown Ushuaia, in the opinion of many, the most exclusive mountain resort in Argentina. Due to the prevailing climatic conditions in the extreme South, the operating season extends longer than in the rest of the ski centers in Argentina. 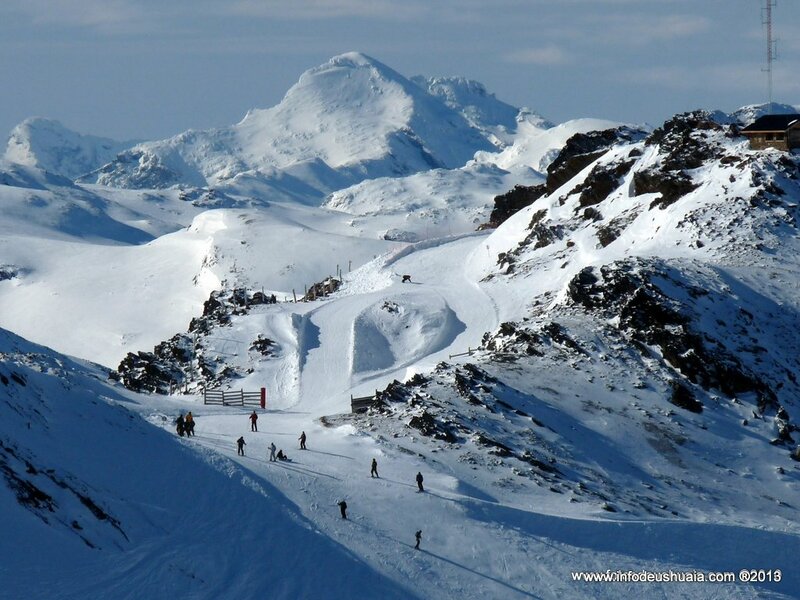 Throughout 20 kilometers wide, Cerro Castor has a total of 24 tracks for different requirements, many of them certified by the International Ski Federation. In November 2013 in the city of Kitzbuhel, Austria, the Ski World Awards, prestigious organization which gathers world experts, nominated Cerro Castor complex as the Best Ski Center in Argentina, distinction based not only on the technical conditions offered by the mountain but also considering the quality of all the services involved, such as ski and snowboard school, equipment rental service, last generation ski lifts, mountain shelters, first aid center, coffee shops, restaurants, Hotels, etc. The most important source of drinking water in Ushuaia is located about 7 km. North of the city, on the slopes of Martial Mountain Range, it is also one of the favorite places for visitors to enjoy the best view of the city. Named after the head of the French expedition, Captain Luis Fernando Martial who, aboard the transport of war "Romanche", visited the region in 1883 with a group of researchers to observe the passage of the planet Venus. Martial Glacier Resort is one of the most important natural attractions and can be visited year round. During the Winter months, the Alpine Ski Center opens its doors with a 1300 mts. main ski slope and other smaller tracks suitable for intermediate level skiers, the climb is facilitated by 100 double seats chairlift, in this complex also operates the "Ushuaia Skiing School". The possibilities the center offers in the summer are numerous, canopy, hiking, and trekking circuits in dream places with different degrees of difficulty and length of routes. An unforgettable experience, perfect for any adventurer, no matter their physical condition. A millenary means of transport, common in regions near the North Pole, whose practice is now widespread as a tourist and recreational activity around Ushuaia. Pure breed polar dogs like the Siberian Husky, Samoyed, Alaskan Malamute, look forward to start the journey through the icy but beautiful landscapes of southern Patagonia. The Winter Activities Calendar also includes a traditional Sled Dog Race which is one of the must-see attractions of the season. These polar dogs are bred in several establishments that offer their services to tour the snowy Patagonian Valley, such as Valle de Lobos, Centro Invernal Haruwen, Villa Las Cotorras, Tierra Mayor, Llanos del Castor, etc. From October to April every season, one of the traditional tours in Ushuaia to watch birds, marine life, observe and scout the extraordinary scenery through the Beagle Channel, thus called after the HMS Beagle, ship that took Charles Darwin on his voyage around the World between 1831 and 1836. This part of the planet was explored in depth by the English naturalist. The maritime passage that runs parallel to the southern shore of Tierra del Fuego Island, also takes other descriptive names on its route. South of the Beagle, are located other Chilean islands belonging to the Tierra del Fuego Archipelago, including the legendary Cape Horn, which is part of many of the tourist voyages. Many other tourist travels are also made by specialized companies, departing daily from the Muelle Turistico de Ushuaia (Ushuaia Tourist Pier) during the high season. The different routes may include visits to emblematic places such as "Estancia Harberton" (Harberton Cattle Ranch), owned by descendants of English pioneers, the first Estancia in Tierra del Fuego, Argentina, whose main house was brought in pieces to assemble from England in 1887; Les Eclaireurs Lighthouse, on the NE islet of the Les Eclaireurs group of small islands, wrongly called "El Faro del Fin del Mundo" (Lighthouse at the End of the World) which is actually further East on the Isla De Los Estados and was a source of inspiration for Jules Verne's world-famous novel; sailing to the Isla de los Lobos (Sea Lion Island) to enjoy the presence of these singular and friendly marine mammals in their own habitat, which swim and play around the boat to the delight especially of children, the boat ride can also include a stop at the Isla de los Pajaros (Island of Birds) in mid-channel, full of cormorants and other birds such as albatrosses, giant petrels, fulmar petrels and many other species of seabirds. During October to end of March each year you can take a guided tour to the Magellanic Penguin Colony of Martillo island and down for a walk through the marked trails, it is also possible to find couples of South American King Penguin, Southern Rockhopper Penguin, also the only breeding colony in the South American territory of another species of penguin, Gentoo (Pygoscelis Papua), represented by the sub-Antarctic Gentoo penguin subspecies (Pygoscelis papua papua). 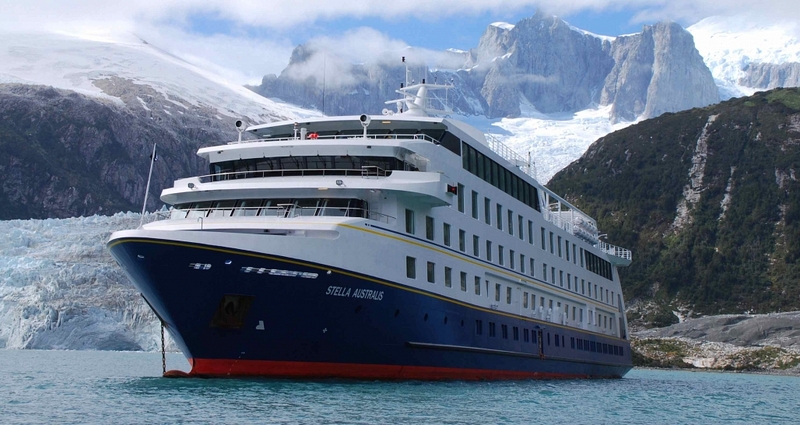 The navigation with Cruceros Australis, a shipping company that performs itineraries departing either from Ushuaia, or the Chilean port of Punta Arenas, through the Strait of Magellan and the Beagle Channel. You can choose various options of tours which take place between October and April every season. In their itineraries to the world famous Cape Horn can be seen towering glaciers, colonies of penguins and elephant seals. The daily shore excursions, included in the cruise, are complemented by audiovisual presentations on ports to visit, fauna and flora of the area, glaciology and history of the region. Tierra del Fuego is internationally considered as one of the greatest destinations for trout fishing. During the season that runs from early November to late April, sport fishermen from around the world come here to spend relaxing days practicing their favorite activity, local tour operators offer a large variety of fishing tours to choose from. The species were introduced in the 30s by John Goodall, pioneer of the area who imported eggs and trout from Bariloche and Chile. These are fully adapted and now inhabit the rivers and lakes of Tierra del Fuego. Four varieties of trout are predominant in the fresh waters of Tierra del Fuego: brown trout, migratory brown trout, rainbow trout and brook trout. If there is something that attracts like a magnet to foreign fishermen, are the legendary "sea trout", which after spending time feeding in saltwater, return to their natural environment with a much larger size. The neighboring town of Rio Grande, is known as the "International Capital of the Trout" but Ushuaia has privileged places such as Lago Fagnano, 100 km. North of the city, one of the largest lakes in South America and the second largest in Argentina. With its tributaries, Valdez, Tuerto, Claro and Milna, offers visitors the opportunity to catch trout up to 10 kilos either from a boat or the shore. There is a lodge, campgrounds, and other services on the edge of the lake. Another of the best places for sport fishing near Ushuaia is Lago Escondido, just 60 km from the city, nestled in the mountains at the foot of Paso Garibaldi and whose name Escondido ("Hidden") is due to being in the middle of the Southern Cordillera de los Andes, surrounded by incredible scenery where you can mainly catch Brown and Rainbow Trout. Other interesting fishing sites are located 70 km. NE from the city, Laguna Margarita with a population of trout specially rainbow composed of specimens of medium size, average of 1 kg. that sometimes can reach 2 kg. or more, and 2 enclosed bays belonging to the southern shore of Lake Fagnano: Laguna Bombilla, also in its south edge fed by the small Rio Bombilla, which comes from Laguna Margarita, located a few km. upstream, here can be found the three salmonid species that inhabit the waters of Tierra del Fuego: Brown, Rainbow and Brook Trout, and Laguna Palacios, run by the Ushuaia Fishing Club. Lago Yehuin (Yehuin Lake), a body of water North of Fagnano Lake, in the heart of Tierra del Fuego Island, within the "Corazon de la Isla" Provincial Reserve, of extraordinarily clear waters, very frequented by sports fishermen and trekking lovers. Near Yehuin Lake stands Shenolsh Hill, which offers the opportunity to observe all the surrounding nature besides being a strategic place for watching the Condors. Special mention must be made to sport fishing in Rio Grande, which rises in the Chilean side of the island and after a zigzagging course flows into the homonymous city, South Atlantic. No wonder the city of Rio Grande is known as the "Capital Internacional de la Trucha" (Trout International Capital). Note: Due to the recent proliferation of the algae called "Dydimo" and the serious injury that occurs in aquatic ecosystems, the relevant government agencies recommend fishermen remove plant debris, mud, algae, sediments and water of the equipment and boats before leaving lakes, ponds or rivers. Moreover, carefully soak all elements in contact with the aquatic environment exposing them at least for one minute in a bleach solution at 2% (a glass in 10 liters of water); 5% salt (sodium chloride 500 grams in 10 liters of water) or hot water above 60 degrees. 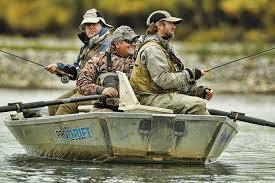 Outfit that absorbs water as waders and life jackets must be soaked for at least 30 minutes. If you can not do this cleaning, it is recommended to completely dry the equipment in the sun and wait 48 hours before reuse.